Out of the swirling smoke of northern California’s wildfires last November came a story that can still be found – with variations on a theme – on social media. It’s a story of a firefighter … checking for hot spots … slowly making his way through the ashen devastation of what just days before had been a family farm. As he passed a pile of rocks, once part of the foundation for a small barn, he could hear some chirping sounds coming from underneath a charred carcass. As he turned the carcass over with his shovel, he was amazed to see four little chicks scurrying around in the ash and dust. And then, as the little chicks grew still, they helplessly turned and stared up at him. It was then he realized that the charred carcass was the remains of a mother hen who’d given her life to save her little ones. An ultimate sacrifice. I’m wondering, I’m just wondering if this precious little story isn’t something of a parable for our lives – especially as a people of the Judeo-Christian faith – as it comes together with our gospel text for this Second Sunday in Lent (Luke 13:31-35). There are a lot of metaphors or images for God “out there” that speak of God’s distant or transcendent relationship to our lives. Like “The man upstairs” or Bette Midler’s famous song, “From a Distance.” But this isn’t the whole truth of the matter, as born witness by the full canon of Scripture. Take careful note of this as we join together in this Lenten season, in First Lutheran’s congregational study of the Book of Psalms. For example: “God is our refuge and strength, a very present help in trouble” (Psalm 46:1; emphasis added.) Or, consider the well-beloved assurance given in Psalm 23: “Even though I walk through the valley of the shadow of death I fear no evil; for thou art with me” (Psalm 23:4; emphasis added). My friends, it’s not enough to say that you believe in God. What matters, finally, is the kind of God in whom you believe (James Barr; The Scope and Authority of the Bible; 52; cf. Terrence Fretheim; The Suffering of God, p.1). The images or metaphors of God with which you live really do matter and they will shape your life – your identity, your ethics – for good or for ill. Think with me on what this image of Jesus as a “mother hen” in Luke 13 might be saying in terms not only of the nature of God, but the kind of relationship God has with us and for us. And what does Jesus mean when he says, “Tell that ol fox [King Herod], ‘Behold, I cast out demons and perform cures today and tomorrow, and the third day I finish my course” (Luke 13:32). What might this “third day” be pointing to? 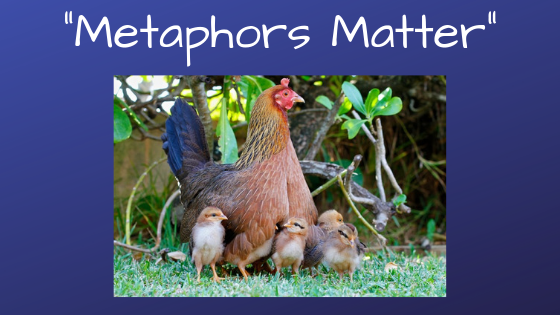 So … what’s the big deal about metaphors or images of God? When it’s a matter of God coming to us in the person of Jesus Christ, who has died and been raised for you and all people, for the forgiveness of sin and a life of salvation … yes, it’s for you. Come and worship this weekend, and hear this Word of God’s promise … a Word that speaks of God’s wondrous sacrificial love for you.